Syrian born Kareem Roustom is an Emmy nominated composer who has composed music for film, television, the concert hall and album projects. Steeped in the musical traditions of the Arab Near East and trained in Western music, Roustom is a musically bi-lingual composer who has collaborated with a wide variety of artists ranging from the Philadelphia Orchestra to Shakira. An active composer of film music, he has scored a number of short and feature-length films, and his score for the PBS documentary “The mosque in Morgantown” earned him an Emmy nomination in the 31st Annual News & Documentary Emmy awards. Roustom’s score for the award-winning documentary Encounter Point earned him the Best Musical Score Award at the 2006 Bend International Film Festival. Of his score for Amreeka (Sundance & Cannes film festival award winner) the Hollywood Reporter wrote "Kareem Roustom's Middle Eastern-flavored score contributes greatly.". About his score to the documentary Budrus (2010) Variety Magazine wrote "A strong string, wind and percussion score by Kareem Roustom adds to the momentum and underlines key moments." In June of 2010 Roustom was awarded a fellowship to the prestigious Sundance Film Composers Lab held annually at the Sundance Institute. Roustom is also the recipient of BMI’s Pete Carpenter Fellowship in film & TV music. As a concert composer Roustom has been commissioned by groups such as the Philadelphia Orchestra, The Boston Children's Chorus, clarinetist Kinan Azmeh and the Damascus Festival Chamber Ensemble, and others. Roustom’s works have also been performed by new music ensembles such as The Firebird Ensemble, The Ibis Camerata, In-Flux, the Apple Hill Chamber players and Intercultural Journeys. New works in progress by Roustom include a large scale choral commission for Easter of 2011 based on the Khalil Gibran’s “Jesus The Son of Man” and the recently completed “Resonances” a double concerto for Arabic violin, cello, hand percussion and string quartet commissioned by Philadelphia Orchestra cellist Ohad Bar-David. 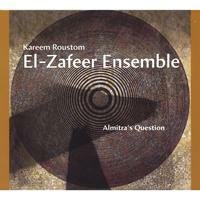 As an arranger Kareem has worked in a wide variety of idioms that range from pop to jazz to Arabic music. Most notably Kareem arranged strings for the Shakira and Beyoncé duet "Beautiful Liar." The song became the fastest rising single in Billboard history and was also nominated for a 2008 Grammy Award (Best Pop Vocal Duet). Kareem also wrote a string arrangement for Shakira's duet performance of "Hips Don't Lie" with Wyclef Jean at the 2007 Grammy Awards. Roustom’s arrangements have been performed by the Slovak Radio Symphony Orchestra, the Zurich Chamber Orchestra, the Philadelphia Sinfonia, members of the Staatskapelle Berlin Orchestra and others. Great music...refreshing to listen to. With today's music market over saturated with a homogenized sound, it is great to hear musicians pushing the boundaries and fusing music from different styles, genres, and parts of our world. difficult to describe, impossible to resist! with no formal music training, i only try to determine whether i enjoy what i hear-i'm not qulified to critique. what i heard was dramatic without being over-produced, with multi-ethnic roots but still accessible to a basically pop-oriented listener. i like the mood- bitter sweet, nothing cloying. gets one in the mood to dance, but also to reflect.